The Missionary Society of St Thomas the Apostle (MST) was formally inaugurated on 22 February 1968. Within these fortysix years the Society has made stupendous development in all fields. Today with a membership of 323 priests and one Bishop and three large mission regions under her protection, the Society can validly claim that she has been faithful in carrying out her duties as the Missionary Institute of the Syro-Malabar Church. But many of the members, especially the young generation, may not be aware of the humble beginnings the Society had, and the circumstances which led to the establishment of the Society. This article is a modest attempt to retrace the history of the beginning of the Society and to make ourselves aware of the great responsibility that we have inherited from our visionary founder. In 1950s there was a sudden boost in the number of young men of the Syro-Malabar Church going to do mission work in India and abroad. Different factors had contributed to this sudden burst in missionary vocations in the Church. The Hierarchy of the Syro-Malabar Church had by then been established and was well in control. Many favorable conditions such as the establishment of the Mission League, starting of Mission Home, and beginning of the Magazine Prekshithakeralam from Mangalapuzha Seminary etc also played a vital role in this missionary awakening. It was in this background that H.E. Sebastian Vayalil while preparing for the Ad Limina visit of 1960 came across the idea of beginning an association of priests of the Syro-Malabar Church to canalize the missionary vocations. Rev. Fathers Kurian Vanchipurackal and John Perumattam were entrusted with the task of preparing the report of the diocese to be presented to the Holy See. The report clearly was an eye opener to the Bishop to see that many young men of the Diocese had to change their rite to become missionaries. It was the immediate reason why the Bishop began to think about forming a missionary association and he included this project also in the Ad Limina report. Thus the love for the Syro-Malabar Church and its traditions was the chief motivating force for the Bishop to think about the missionary association. It must be the same love and concern for the traditions of this Church that should become now the stabilizing force of the Society. It was in Rome that the idea of a missionary association got more clarity. While presenting his report to Pope John XXIII, the Bishop informed him of the plan to begin an association for mission work. Welcoming the idea, the Pope asked the Bishop to consult with the experts in Oriental Congregation and Propagande Fide. The Congregations now suggested the Bishop to begin a Missionary Society instead of a religious congregation, as there had been several already in India. Thus the idea about the missionary association got more clarity with the discussions held at Rome. Coming back from the Ad limina visit Mar Vayalil in an official meeting of the Syro-Malabar Bishop’s Conference, proposed the plan for a missionary Society for the Church. He suggested: “It should be a common society of the whole Malabar Church to be erected by the hierarchy and placed under it”. The Bishops approved the step and promised their support. They asked Mar Vayalil to take up responsibility, as there were more vocations in the diocese of Pala. The Bishop now began official consultation with his priests who were interested in the idea. He convened a meeting of the interested priests at 3.00 pm on 25 March 1963 at the Bishop’s House. Msgr Philip Valiyil (V.G), Rev. Fathers Mathew Kottarathumialy (Chancellor), Joseph Maliparampil, Abraham Kaipanplackal, Kurian Vanchipurackal, Sebastian Pottanany, Abraham Ettackakunnel, Francis Kandathil, and John Perumattam attended the meeting. “His Lordship the Bishop in his speech to the priests assembled explained the purpose of the meeting. He told them that on the occasion of his ad limina visit to Rome in 1960he had submitted an application to the Ap. See requesting permission to start a missionary institute for the propagation of faith in India and that now he was authorized by the Sacred Congregation for the Oriental Churches to take the necessary steps for the foundation of a missionary institute as he desired and to send its constitution to Rome for approbation. The members welcomed the idea”. However the meeting was not able to reach a conclusion about the exact nature of the proposed institute. A committee was constituted to draft the statutes of the future society. Rev. Fathers Kurian Vanchipurackal and John Perumattam were the members of it. A second meeting of the priests was convened on 3 March 1964. Its main purpose was to discuss the draft constitution. Msgr Philip Valiyil, Fathers Mathew Kottarathumialy, Thomas Purayidom, Joseph Maliparampil, Abraham Ettackakunnel, Augustine Kandathil, Sebastian Pottananickal, Kuriakose Mampuzha, Alexander Cherukarakunnel, Joseph Nadayath, Jacob Maliekal, T.C. Joseph, Jacob Plathottam and John Perumattam were the participants this time. “During the meeting each article of the draft constitution was read with explanations when needed and passed with amendments proposed by the members. The meeting came to a close at about 5.30pm with the decision taken to send the constitution to Sacred Congregation for the Eastern Churches as early as possible”. Bishop Mar Vayalil later got the permission of the Bishop’s Conference to submit the draft to the Holy See. The draft was sent to Rome on 14 March 1964. A third meeting of the priests was convened on 22 January 1965. The Bishop informed the members of the permission he had to start and organize the missionary institute as a Pious Union of the diocesan clergy for mission work. Nine out of the twenty-five priests present inscribed their names as the members of the pious Union. They were Jospeh Maliparampil, Abraham Kaipanplackal, Abraham Ettackakunnel, Augustine Puthenpura, Francis Kandathil, George Kuzhikandam, Joseph Puthenpura, Paul Naickarakudy, and John Perumattam. Mar Sebastian Vayalil was unanimously chosen as the president of the Pious Union and Fr John Perumattam as the secretary and treasurer. Another meeting was held at the Bishop’s House on 8-9 March 1965. The participants were the members of the Pious Union and the priests of the bishop’s House. The meeting decided to send a circular to the priests of the diocese informing them of the nature and purpose of the Pious Union. Meanwhile the Bishop admitted nine students destined for the future missionary Society to the Good Shepherd Minor Seminary. They were Joseph Puthuppally, Thomas Varakil, Thomas Parayady, Joseph Varikatt, Joseph Ancheril, Mathew Karipath, Joseph Maramattam, Kurian Ammanathukunnel, and Mathew Valanatt. Meanwhile some more priests had joined the Pious Union. They were Thomas Ayathamattam, Kurain Valiamangalam, Joseph Puthiath, Zahcharias Thudipara, Thomas Chellantahra, and Joseph Palackatukunnel. The Statutes for the Missionary Society was approved by the Holy See on 13 June 1967. Bishop Vayalil was authorized to erect the Society and promulgate the Statutes. An extraordinary meeting of those who were interested in the mission work of the Kerala Church was held on 26 October 1967. Invitation was sent to all priests of the Pala diocese and 80 of them attended. In the meeting the Bishop explained all the steps he had so far taken towards the forming of a missionary Society on behalf of the Archbishops and bishops of the Syro-Malabar Church. All fathers present whole-heartedly supported the idea and promised their full co-operation. Rev Dr C.T. Kottaram on behalf of all the priests present offered one day’s Holy Mass for this purpose. After the meeting a few more priests joined the Pious Union. They were George Kuthiavalchel, Jacob Plathottam, John Kadookunnel, Joseph Ayathamattam, Joseph Karikilamthadam, John Plackeel, Abraham Kaniampady, Joseph Kochayyankanal, Sebastian Pottanany, and Abraham Parappuram. The Missionary Society of St Thomas the apostle was formally erected and its Constitution was promulgated on 22 February 1968 by Bishop Sebastian Vayalil in a function presided over by Cardinal Maxmilian de Furstenburg. The foundation stone for the Central House of the Society was also laid on that day. Let me copy down the exact words from the Diary of MST. “Twenty Second February 1968 must be considered a red-letter day in the history of the St Thomas Christians, for, it is on this day the foundation for two great projects, one for a missionary institute and the other for a scheme of mission work outside Kerala, the first of its kind in the two thousand years’ history of the Church of St Thomas Christians, in the presence of the Sacred Hierarchy of the universal and local Churches, has been laid for the interior and exterior renovation of the Church and thereby to spread the message of Christ. At about 5.30pm, February 22 Thursday, 1968 His Eminence Maxmilian Cardinal de Furstenburg reached Ampara, the site of the future headquarters of the Missionary Society of St Thomas the Apostle, accompanied by His Excellency the most Reverend Joseph Caprio, Pro-nuncio to India and the Archbishops and Bishops of the Malabar Church to lay the foundation stone of the Missionary Society. The papal representatives were given a most enthusiastic welcome by the clergy and laity of the parish under the leadership of Very Rev. Fr Kuriakose Muthukattil, parish priest of Bharananganam. Apart from His Eminence Cardinal and the Pro-nuncio the following prelates were present for the function: His Grace Arch Bishop Mar Mathew Kavukatt, His Excellency Mar Sebastian Vayalil, His Excellency Mar Sebastian Valloppilly, Rt Rev Monsignori Rizzi, and Durphy, the two secretaries of the Roman Curia, Rt Rev Msgri Philip Vayalil, Jacob Vellaringatt, Joseph Kuriathadam, Kurian Vanchipurackal, and Thomas Moothedam. The Panchayat President Mr Damodaran Nair garlanded His Eminence. His Excellency Mar Sebastian Vayalil gave the welcome Address, inviting His Eminence Cardinal Maximilian to do the laying function of the foundation stone of the Central of the Missionary Society of St Thomas the Apostle. His Eminence in his speech said that this event should have much importance not only in Kerala and India but also in the whole world”. A few acres of land was already procured at Melampara at the initiative of Father Ettackakunnel. Plathottam Mathunni Mathunni (2 acres) and Koottarappillil Chacko (one acre) and other generous people donated a major portion of it. Eight acres of land was purchased using the fund provided by the Holy See. The House of the Society, which was to become the head quarters of MST, started to function at Ampara on 20-01-1969. That was the reason why Deepti College used to celebrate its Home Day on this day for a long time. Rev. Fr Augustine Puthenpura, who was the Vicar of Adivaram was nominated as the first Superior of the House. Rev. Fathers Sebastian Pottanany and John Plackeel were the other inmates of the House. Deepti Bhavan, which was constructed under the supervision of Rev. Fr Sebastian Pottannany according to the plan drawn by Larry Baker, was solemnly inaugurated on 30 December 1972 by His Eminence Cardinal Joseph Parekkattil. “In the evening of the 30th our headquarters, Deepti Bhavan and Deepti College were formally and solemnly inaugurated by His Eminence Joseph Cardinal Parekkattil in a public gathering presided over by His Grace Arch bishop Mar Antony Padiyara and graced by H.E. Bishop Sebastian Vayalil, H.E. Bishop Sebastian Mankuzhikary, Rt Rev. Msgr Mathew Vellankal, Very Rev. Fathers Dominic and Rossignol, Rectors of Alwaye and Bangalore seminaries, Very Rev. Fr Loze and a vast audience of other distinguished guests”. Once the Society began to function, the next thought was of starting the Minor Seminary. The most important question was where to begin it. “All possible houses for rent in and around Bharanganam were considered. Suggestion came to start the Minor Seminary at the Sea View Estate and it was almost considered possible. Information came from Rev. Fr Mathew Kattady that he was ready to conduct the Minor Seminary in Trivandrum and find means to run it till buildings become ready at Ampara. But on March 11, when all gathered at Bishop’s House (First General Assembly), contrary to all calculations, it was decided to start the Minor Seminary that year itself at Ampara and to erect building ad hoc borrowing the necessary fund from any source”.Thus Deepti College, the Minor Seminary of MST, officially came into being on 31 August 1969 with Rev. Fr Sebastian Thuruthel as Rector and Rev. Fr Joseph Thaiparampil as Spiritual Father. On 1 September 1969 classes began with 35 students. Right from the beginning of the attempts to form a missionary institute of the Syro-Malabar Church there is one idea running through. The sons of the Christians of St Thomas must be able to do evangelization outside Kerala in their own rite. That is why Bishop Vayalil always had this preoccupation of forming an institute as a common society of the whole Syro-Malabar Church. Today the Society has a duty to remind the present hierarchy of the Church, who may not be well aware of it, of the support and encouragement and patronage offered to MST by the Hierarchy of the Syro-Malabar Church at the time of its beginning. Cardinal Lourdsamy once termed MST “as an institution recognized as an expression of the apostolic vocation of the Syro-Malabar Church and permitting the fulfillment of the missionary aspirations of individual members of this Church”. There are mainly two reasons why MST can be qualified as the missionary wing of the Syro-Malabar Church. 1. MST was conceived, envisaged and instituted as a common missionary venture of the SMC. Late Bishop Vayalil, the founder of the Society always had this idea of a Missionary institute for the SMC. 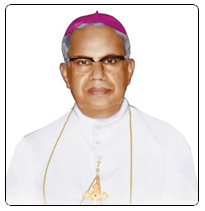 After his Ad Limina visit of 1960, Bishop Vayalil proposed his idea to the Syro-Malabar Bishop’s Council. There were mainly two things that he put forward before the Council: That the Society was to be erected by the hierarchy of the Church and that it should be placed under it. It shows that the Bishop himself had no plan to take full responsibility of the Society. He wanted it to be directly under the SMC. The Bishop’s Council agreed to it and they entrusted Bishop Vayalil with the formalities. Before submitting the drafts of the Statutes of the Society to the Holy See for approval, the SMC hierarchy was once again consulted and its consent was secured by Bishop Vayalil. On the day of the inauguration of the Society in his address to the congregation gathered at Ampara, Bishop Vayalil qualified the erection of the Society as a step in the right direction sponsored by the SMC. “It is a venture in the right direction sponsored by the Syro-Malabar Hierarchy…. It is a noble endeavor of the Syro-Malabar Church, deserving our full support”. Thus he had always taken the SMC hierarchy into confidence in the formation of the Society. No where do we find any suggestion to make the Society an institute of the Pala diocese. Rev. Fr Maliparampil, the first Director General of MST, emphasized this particular aspect of the Society in his first letters. In the decisions of the first General Assembly of the Society there is clause where the Assembly asks the Society to take appropriate steps to ensure that the whole Church understands the Society as hers, not as that of the Pala diocese. We have to bear in mind the fact that at the time of the erection of the Society canonically there were only two options: to begin the Society with a diocesan or Pontifical status. A new society could start only with a diocesan status. The Syro-Malabar Hierarchy has from time to time acknowledged the particular vocation and role of MST as a missionary society of the Church. Arch Bishops and Bishops of the Church were present at the inaugural celebration at Ampara. It was inaugurated on 22 February 1968 by his Eminence Maximillian Cardinal Furstenburg in the presence of Pronuncio Archbishop Caprio. Of the seven prelates of the Syro-Malabar Dioceses four (Archbishops Parecattil and Kavukatt, and Bishops Valloppilly and Vayalil) were present in the function. (The other three were having unavoidable reasons and hence could not reach Ampara). The hierarchy had issued a joint pastoral letter in connection with the erection of the Society. On the occasion of the Silver jubilee of the MST another joint pastoral letter was issued and in it the Bishops termed the Society as a common concern of the SMC. Late Simon Card. Lourdsamy, the then prefect of the Sacred Congregation for the Oriental Churches, on 10.05.1988 termed MST as the expression of the apostolic vocation of the SMC. In the archives of the MST, there are letters of almost all bishops of the Syro-Malabar Church giving their blessings and full support to the Society at the time of its canonical erection. In the Church calendar published from Ernakulam, among the unforgettable dates of the Church, we see this from 1969 onwards, “1968 Feb 28: Formal inauguration of the Missionary Society of St Thomas the Apostle meant for the whole Malabar Church by Cardinal Maximillan at Palai”. Very Rev Fr Joseph Maliparampil Director General of MST for two terms and one of the first priests to join MST was from the diocese of Changanachery. When Deepti College was started in 1969 the first staff constituted itself from different dioceses. Rev Frs Thaiparampil, Naduvilezham (Changanachery), Thachil (Ernakulam), and Kandanattu (Thalassery) were only some among them. When the MST is completing 43 years of its existence, it may be good for us to ask ourselves whether we really live up to the expectations of the Church or whether MST finds its proper place in the missionary endeavors and responsibilities of SMC. Today while manyof the founder members and pioneer members are still alive, we have to rededicate ourselves to the missionary cause for which Society was conceived and instituted. We may think also of the possibilities of making the present Hierarchy of the SMC own the Society, as the first generation of the Syro-Malabar Hierarchy had done. Perhaps we may have to be more interested in and concerned with the life of the Church to be owned by her. “The Society as a whole is conscious of its identity – a missionary community bearing the seal of the mother Church. We should be completely at the disposal of the Mother Church to actualize her missionary vocation. We should find our spirituality in it”. Fr J. Maliparampil, “Missionary Society of St Thomas the Apostle”, in Deepti Directory 1976-77, p. 32. Cardinal Lourdasmay in his message to the General Assembly of MST in 1988, published in the report of the General Assembly of MST in 1988. Report of the Director General presented to the General Assembly held at Deepti Bhavan on 12 July 1973, p.1, from the Archives of MST. Report of the Director General presented tot eh General Assembly held at Deepti Bhavan on 12 July 1973, p.4, from the Archives of MST. From the interview done by S. Vadakel of the Bishop Vayalil. Cfr Vadakel, An Indigenous Missionary Endeavor, Kottayam, 1990, p. 97. From the Diary, signed by Fr John Perumattam, kept in the Archives of MST. Quoted from the Diary, p.3. Quoted from the Diary, 3 March 1964, p. 5. See the Diary, p. 7. See the Diary 26 October 1967, 11. From the Diary kept in Archives of MST, pp. 15-16. “The land was procured by the efforts of Fr Ettackakunnel who lived and died for the Mission”. Fr J. Maliparampil, “Missionary Society of St Thomas the Apostle”, in Deepti Directory 1976-77, p. 32. Others who donated their land were Joseph Mathai Kalayathinal (.50 acres), Jospeh Mathunny Parayil (.50), Devasia Devasia Kalayathinal Kochuplackal (.50), Mathai Devasia Kalayathinal Kochuplackal (.25), Ulahannan Devasia Kalayathianl Kochuplackal (.25), Pothen Pothen Koottarappallikunnel (.31), Vargheese Chacko Mazhuvancheril (.25), Joseph Mani Poovathinal (.25) and Prof. P.J. Mathew Perukalamkattil (.32). Cfr Directory of the Missionary Society of St Thomas the Apostle 1989-90, pp 65-66. Report of the Director General presented tot eh General Assembly held at Deepti Bhavan on 12 July 1975, p.3, from the Archives of MST. Report of the D.G. to the General Assembly 1973, p. 2. From the message of Simon Cardinal Lourdsamy to the General Assembly of 1988. From an interview with Mar Sebastian Vayalil done by S. Vadakel. See S. Vadakel, An Indigenous Missionary Endeavor, Kottayam, 1990, p. 97. From the inaugural address of Bishop Sebastian Vayalil on 22 February 1968. Let me quote from the Report of the D.G. to the General Assembly of 1973. “We are always grateful to the Malabar Hierarchy which always shows great interest in our welfare. All the Archbishops and Bishops have visited Deepti and encouraged us by their joint Pastoral. The Archbishops of Changanachery spared two efficient priests for the staff of Deepti College for the first three years. Thus we got Frs Joseph Thaiparampil and Naduvilezham. The Cardinal Archbishop of Ernakulam did not hesitate to send his multi-gifted priest, Rev. Fr Joseph Thachil, for our staff, even though the Cardinal was feeling the dearth of priests in the archdiocese. The other bishops have promised co-operation when and where required. H.E. Bishop Valloppally presented us with a very fine organ and he himself inaugurated our choir.”Report of the Director General, 1973, p. 4. The first General Assembly itself had defined who would be called pioneer members. “Priests joining the Society within three years from the date of the erection of the Society were to be considered as pioneer members” according to it. See the Decisions of the General Assembly held at Bishop’s House, Pala on 11 March 1968. (from the archives of MST). The First General Assembly had also laid down the two obligations of the members of the society: To find vocations and benefactors and to foster mission spirit. See the Decisions of the General Assembly held at Bishop’s House, Pala on 11 March 1968. (from the archives of MST). Quoted from the Report of the General Assembly of MST 1988, p. 10. Kerala - 686 578, India.